Guitar Hawaii Hoi An Live Music Bar is a bar, organizing live music everynight, serving to the entertainment needs of tourists,. Why Guitar Hawaii Hoi An Live Music Bar is special ? Guitar Hawaii offers friendly space for guests to enjoy music. Tourists have known this café and some have come to sing, accompanied by Tam and the bandsmen. Not limited to just a few kinds of music, the band and singers perform different types. In addition to moving love songs by late renowned Trinh Cong Son are beautiful songs by Pham Duy, gentle and swanky works by Cung Tien and some other popular Vietnamese composers. The audience can also hear Blues, Rock ‘n’ Roll, Flamenco and internationally popular songs. A laminated black and white picture of Trinh Cong Son is put visibly on the piano on the stage. Mot coi di ve (A place for leaving and returning) by Trinh is performed. All seem to add some more spices to a trip to Hoi An. What to explore at Guitar Hawaii Hoi An Live Music Bar? Great place to chill out and have a drink and listen to a variety of live music, from classical Vietnamese ballards, to flamenco instrumentals to American rock and roll. Every night seems like open mic night, so if you're musically inclined and talented, you can get up and play with the band (they have stacks of instruments), if not, just sit back and enjoy! Hoi an's best kept secret! Guitar Hawaii is a fantastic live music venue in Hoi An, Vietnam. 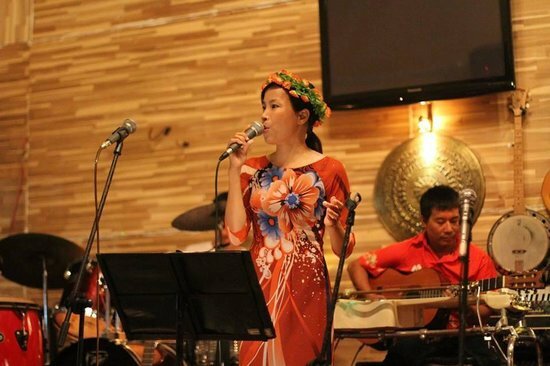 The band (led by the super talented Huu Tam) play a mixture of American/British hits and traditional Vietnamese songs.It's rare to find a venue dedicated to live music EVERY night! No matter when you go there, it's buzzing and the band are always spot on. They encourage audience members to sing or if you play an instrument you're more than welcome to get up and show off your skills.I play drums in Australia and went to the Guitar Hawaii in 2008. I got up to play a couple of songs and then ended up partying with the band for two nights straight! I returned to Hoi An last year and once again met up with Tam and band. We all had a great time and I can't wait to go back!The Guitar Hawaii is in a convenient location between the beach and Hoi An town and is well worth the trip, especially if you're into great live music and atmosphere. Drinks are very reasonably priced and the people there are super friendly and fun. I will definitely be back for a third time soon! Thanks Tam and Guitar Hawaii! Really good tasty drink, nice relaxed atmosphere. It must be good, it's our 2nd visit here! The drink was well presented and reasonably priced. The best guitarist in Rock like Canon in D and Flamenco. They sing also Vietnamese and western song. My darling played felling drum with this great band. We had great time there. Guitar Hawaii is a fantastic live music venue in Hoi An, Vietnam. The band (led by the super talented Huu Tam) play a mixture of American/British hits and traditional Vietnamese songs. It's rare to find a venue dedicated to live music EVERY night! No matter when you go there, it's buzzing and the band are always spot on. They encourage audience members to sing or if you play an instrument you're more than welcome to get up and show off your skills. I play drums in Australia and went to the Guitar Hawaii in 2008. I got up to play a couple of songs and then ended up partying with the band for two nights straight! I returned to Hoi An last year and once again met up with Tam and band. We all had a great time and I can't wait to go back! The Guitar Hawaii is in a convenient location between the beach and Hoi An town and is well worth the trip, especially if you're into great live music and atmosphere. Drinks are very reasonably priced and the people there are super friendly and fun. I will definitely be back for a third time soon! Thanks Tam and Guitar Hawaii!